The following is a re-print of an article appearing in the PCA NER Newsletter - The Nor'Easter, in 1998. Kevin Saltzman of Randolph Racing wrote this account of his experience preparing a world-class race car for a world-class race: the historic 50/50 event at Watkins Glen. The event celebrated the 50th anniversaries of both Porsche Automobiles and Road Racing at Watkins Glen. The text has been "edited for the web". Well there I was, getting out of my car after a 90 minute drive from the south shore to N.H.I.S. Just as I opened the car door upon arriving, someone said "Did you see Russ` car?" A short walk to the hot pits confirmed my worst nightmare. Another car got loose entering the straightaway and lost control, taking out Russ' RANDOLPH RACING prepared 911 Turbo! So there we were - twenty days away from running in C class at the 50/50 at Watkins Glen with a wrecked car. Bill Hawe to the rescue! Bill and Russ Castagna have been piloting and co-piloting at the Glen for years. 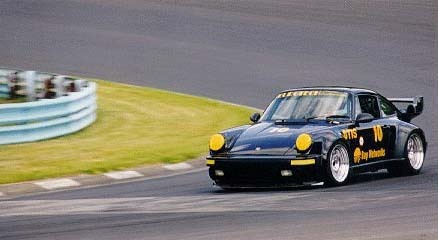 As such Bill offered to let Russ drive his 911 Turbo at the 50/50 and the rest was history. Our next task at Randolph Racing was to prepare the car for the race. We soon found out that because of certain modifications that Bill had previously done to his engine, we would be running in GT1S class. "Oh Boy!!" Bill has had his car at our shop a few times in the past. Last summer we replaced the injectors and re-set up the engine and it has been running well ever since. The only changes we subsequently made in the engine bay were to add a "RATPIPE" to the Turbo, take the engine off loop, and fatten up the air/fuel mixture. The next the real task was to work on the suspension. Our strategy was to make Bill’s suspension a carbon copy of Russ‘s car, which I designed with major input from Peter Dawe of Kelly Moss Racing. We first baselined Bill’s suspension settings. Then we completely removed Bill’s stock suspension and rebuilt it using front a-arm bearings, rear trailing arm pivot bearings, stiffer torsion bars at both ends, new ball joints, and front and rear "Charlie Bar" sway bar systems. By doing this, we stiffened the car as much as possible, and removed most of the slop in the suspension in order to use all the handling the car had to offer. We then gusset strengthened the front a-arms, and back gusseted the rear sway bar mounts on the body. This is a very critical item, as we run the Charlie bars tight in the rear to maximize control with regard to throttle steer. One last change was the addition of new brake rotors. The new rears were stock, but the fronts were the newest Alcon design called Daytona Endurance Rotors, supplied by Dopke designs Inc. With all this completed it was off to C+G (Russ‘s business) to make the final "Track alignment" on Tuesday night. Within a few hours it was in "Chads" trailer headed for the Glen! I made it to the Glen on Thursday and located the crews’ spot in the infield paddock area. 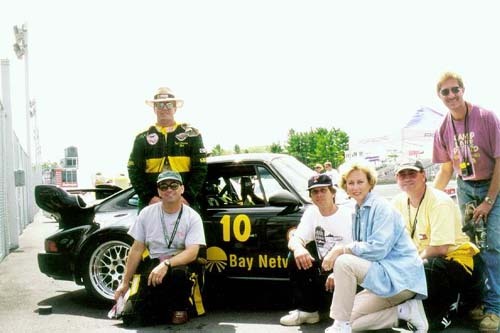 Our crew consisted of Bill Chadwick, Karen & Doug Adams, Bill Hawe, Christopher Castagna and myself. Practice went well on Thursday & Friday. The weather was awesome. We only had to make some minor swaybar adjustments to stop a little bit of push, and we removed some of the rear brake pad lining surface to change the brake bias. Saturday morning arrived with cloudy skies. A few minutes before practice it started to rain. We quickly put on the rain tires, and Russ was on his way. Within minutes Russ was putting (no lie) 35 seconds a lap on our nearest opponent. The track dried out in time for the sprint race (much to our disappointment) and after 20 minutes Russ pulled a 3rd place. The big day finally arrived. Sunday, August 30th, and we were pumped!!!! The Enduro (one hour) race was a few hours away. We practiced our pit stop routine and went over our pit-in strategy. (We had to make a 5-minute mandatory "Timed" pit stop). Our strategy was to keep Russ out there as long as the fuel would last. We were waiting for a full course yellow, the perfect time to pit in. Sure enough, luck would go our way. 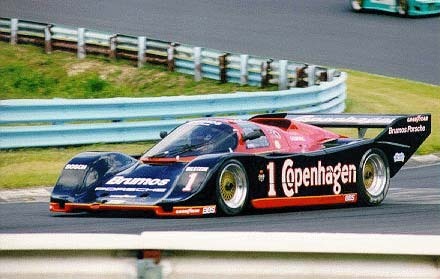 I was fairly sure we were now running 1st in class but Bill Hawe kept reminding me about the "Fat Lady". At the finish it was Hurley Haywood in his Brumos 962 (pictured above) followed by Brian Redman in his Amalfi 962. 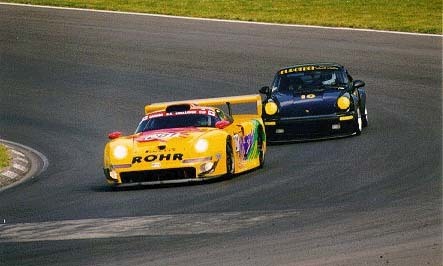 Russ finished near the top in Bill Hawe’s 930, ahead of the Rohr GT-1 (yellow car 2 above). I headed to the tower to wait for the printed results. YES!!! We had won our class!! I was ecstatic! Russell and all the other club racers did a great job representing the Northeast Region. Thanks to Russell and a great crew! And thanks to Brian Redman and his group for putting on this awesome event, by far the best Porsche weekend of my life! And of course thank you Bill Hawe for really making it all come together and allowing a little history to be made. Thanks also to all the club racers who participated from the Northeast Region. I am pleased that I was able to be a part of this great event.